Fourbirdsaboating will be having their first official team photo taken at no other than the historical Bisham Abbey National Sports Centre in a few weeks time. A centre which offers world class facilities to Britain’s leading sports men and women and is home to the Bisham Abbey Sailing and Navigation School where the team will undertake much of their ocean row and RYA training. Example of an ocean rowing boat and team, complete with opportunities to display corporate logo. 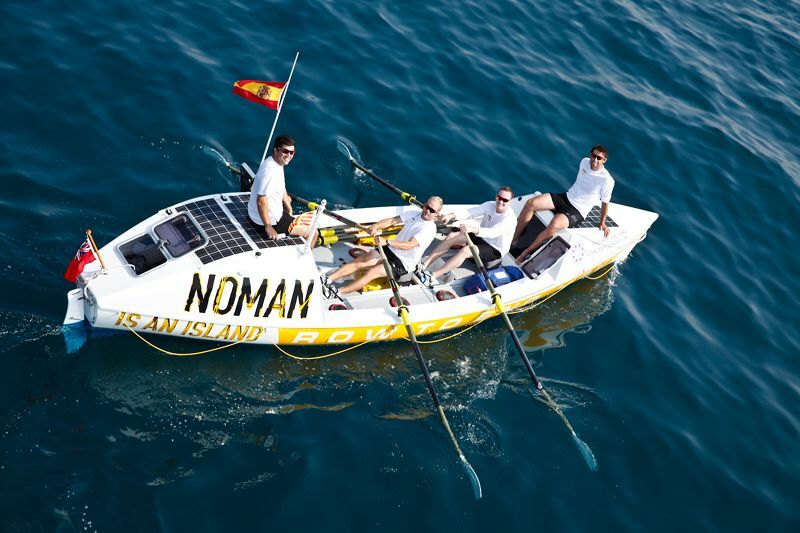 This is the Noman team using their row to raise funds to prevent HPV cancer. The team of five ladies (four plus one reserve) are offering one lucky corporate sponsor, the opportunity to come along and play an active part in the team’s first official training weekend and to appear in their first official photograph which will be used for future promotions. the banner will feature in the promo video from the weekend for distribution via the team’s website and social media and your own publicity and social media. the banner will feature in a documentary of the expedition to be made post Pacific Ocean row in 2015.
the banner and a representative from the corporate sponsor will appear in the first official team photograph which will be used in future publicity and sent out with a press release to announce the final team members for the 8 month World record breaking Pacific Ocean row in 2014.
their corporation’s name to be included in the official press release for the 2 day event. their corporate logo will be featured on the team’s website list of sponsors with a click through link to their own website throughout the expedition and beyond. their corporate logo will be be given a dedicated space of 1/3 square metre on the Fourbirdsaboating training boat. This boat will feature in photographs, film footage, and be on display at several national events such as the London Boat Show, BETT Educational Learning Show, Henley Living Advent over the next 9 months. their corporate logo will be be given a dedicated space of 12inches wide on the Fourbirdsaboating purpose built expedition boat ‘Mr Toad‘. This boat will feature in photographs, film footage, and a documentary during the journey from California to Hawaii and on to Australia, giving you access to both local and an international audience. their logo will be seen in much of the press coverage throughout. their corporate logo and sponsorship will be included in the team’s weekly newsletter which goes out to around 2000 people per week. Sponsorship will appear in the week before and the week following the event. their corporate logo and sponsorship and involvement will be covered in the team’s website photos and blog, much of which will be shared via the team’s social media outlets. over the course of the two days, the team will tweet about the corporate sponsorship and post messages on their Facebook page. the corporate sponsor will be invited to the Fourbirdsaboating’s official send off event in 2014, where Mr Toad will be on display and folks will get to see the boat. If you would like to become the Headline Sponsor for the team’s very first training weekend, please get in touch here or via the contact form below. Download details of the opportunity here.